Don’t you just hate packing? You never dreamed you had so much stuff to wrap up and box until you decided to move! Move day can be hectic, especially when you have a lot of large items to haul. One item that is particularly challenging to pack is your mattress. The following article will discuss how to correctly pack your mattress with more care and less stress. Strip off your comforter, sheets, mattress cover, and mattress pad and wash and pack these in a storage bag. Use a vacuum attachment to pull up debris and dust mites from your mattress as an additional cleanup measure. You can prevent your mattress from getting torn, dirty or wet by covering and taping it down with a thick, durable plastic tarp. Or you could buy a mattress cover preferably with handles from your local moving company. Pad the mattress corners with cushion foam to give these areas extra protection from hard bumps. Mattresses can be super heavy to move and slide into position. 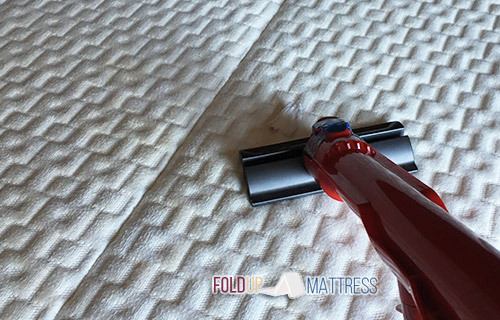 Pad the underside of the mattress with smooth fabrics like old bed sheets or comforters to keep the plastic cover intact and to slide it easier. Use forearm forklifts to tote the mattress to avoid muscle strain from lifting it with your arms. Consider renting an enclosed moving truck. This will ensure bad weather or other road surprises won’t damage your mattress. Wedge your mattress between heavy items such as a kitchen table or a dresser in the upright position to protect it from being knocked around in your moving truck or trailer. Any standard-size mattress will fit inside a ReloCube (or a trailer). In order to keep your mattress stable, hoist your mattress with straps or durable utility rope on the inside wall of the ReloCube. It’s a good idea to ask advice from your mattress manufacturer on the best way to move specific mattress brands. For example, you should not fold or lay a Tempur-Pedic mattress on its side. An inflatable mattress can be placed upright but must be handled with care since some of its parts can easily snap off. It’s highly recommended that you use a closure cap to seal off the air chamber and move the pump separately. Mattresses generally aren’t handled as carefully as they should. But there’s no reason to ruin the springs, the fabric, the cushioning, or any other structural parts of your mattress because you didn’t support or pack it correctly. Handle it as delicately as possible as you would any of your other furniture pieces to preserve its life and performance!